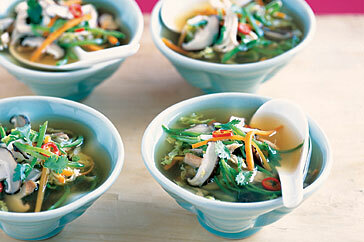 Combine stock, 2 cups water, soy sauce and chillies in a large saucepan over medium heat. Bring to a simmer. Add carrots, mushrooms, snow peas and chicken to pan. Reduce heat to medium-low and simmer for 2 minutes. Add cabbage and cook for 1 minute or until cabbage wilts. Stir half the coriander into soup. Divide soup between bowls. Top with remaining coriander and serve. Note: Half a Chinese cabbage will give you 3 cups shredded cabbage.